When the touring show "In My Life - A Musical Theatre Tribute to the Beatles" returns to the Warner Grand Theatre in San Pedro on April 19, be on the lookout for two quartets – not just one. The Poly High School string quartet will join the professional actors on stage. Poly juniors Elizabeth Robinet, Erin Osman, Timothy White and Sofia Salcedo will join the band for the songs "Eleanor Rigby," "Yesterday," "A Day in the Life," "Hello Goodbye," and "Hey Jude." In a special touch, "Yesterday" is played as a scene in which the Paul McCartney character plays the song for the first time for Beatles producer George Martin, with the songwriter explaining that he envisioned a string quartet accompaniment. "In My Life" is the musical retelling of the Beatles story through the eyes of manager Brian Epstein and features the live music of renowned tribute band, Abbey Road. The production includes multimedia, period costumes and vintage instruments. It has toured for years, receiving rave reviews. 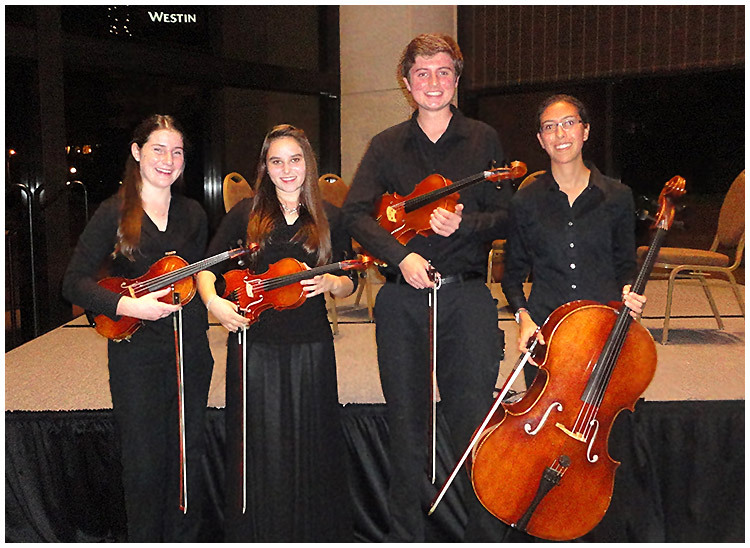 The Poly quartet members also perform with their school’s Chamber Orchestra and have been selected each year of high school to perform with the All District Honors Orchestra. In addition to maintaining 4.0 or better grade point averages in the school's college preparatory PACE program, the members help operate a non-profit, public benefit corporation that brings ecologically friendly school and office supplies to educational institutions. They volunteer as ushers with the Long Beach Symphony Orchestra, and their quartet has opened for a Long Beach Symphony Orchestra concert. Robinet, Osman and Salcedo run cross country and track at Poly, and White plays varsity tennis. The producers of "In My Life" approached Andy Osman, a 30-year music teacher at Poly (and quartet member Erin’s dad) looking for a talented ensemble that could hold their own with a rock band in front of an audience. Quartet member Robinet has been a lifelong Beatles fan. "My parents are huge fans, and I can remember dancing with my mother in the living room to Beatles music when I was very young," said the junior. Erin Osman, who maintains a 4.45 grade point average and was a founding member of the nonprofit, public benefit corporation called Long Beach EcoScholars, grew up loving Beatles music. "My mother and I would play and sing Beatles songs at the piano when I was a little kid," she said. "It's going to be an amazing experience to perform their music." The quartet also performs at weddings and other events under the name “Calithos Quartet” and may be hired by emailing calithosquartet@gmail.com. “In My Life” plays at 2 p.m. Sunday, April 19 at the Warner Grand Theatre, 478 W. 6th Street (at Pacific) in San Pedro. Tickets are $20 to $40, plus ticket fees, and may be purchased online with at tix.com (search “In My Life”) or by calling 800-595-4849. Tickets purchased at the door will be cash only. Poly has been selected six times by the GRAMMY Foundation as a GRAMMY Signature School, and twice as a Signature “Gold” school, recognizing it as one of the top high school programs in the nation. SCHOLARLY MUSICIANS – Poly High School students Erin Osman, Elizabeth Robinet, Timothy White and Sofia Salcedo will join professional performers during an April 19 musical tribute to the Beatles. The students maintain 4.0 or better GPAs while participating in sports and volunteering with the Long Beach Symphony.